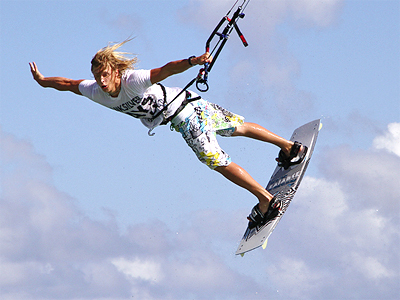 Pyotr Tyushkevich has become the first Russian to successfully kite surf across the Gulf of Finland, in the record time of just three hours. ­It was tough going for the 24-year-old World Champion as a lack of wind hampered his progress, but he managed to overcome the elements to complete the 80-kilometer distance from Estonia to Finland. After much frustration, it finally seemed as though Pyotr might be able to start his attempt to kite surf across the Gulf of Finland. The weather conditions had hindered him up until now, and even now in what was his latest effort, the elements were once again proving to be unfavorable, as a distinct lack of wind was always going to prove a problem. However, he made a promising start, and in what seemed no time at all, was already miles away from the Estonian coastline, and his coach, Aleksey was pleased with his progress, a quarter of the way through his 80-kilometer journey. The lack of wind continued to cause Pyotr problems. So much so that he fell into the water, as there was not wind to keep his kite airborne. However, he was soon back on his board, as the Finnish coastline, which was also his finishing line, drew ever closer. This whole challenge was a completely new experience for the 24-year-old Russian. He may be a world champion kite surfer, but normally he is used to performing tricks over a short period of time in good conditions, and not having to surf a distance of around 80 kilometers with the elements against him. Not surprisingly, he was exhausted after his endeavors, as he had had to work doubly hard due to a lack of wind, however, he can now relax after completing this fantastic feat. He may have completed this challenge, however, Pyotr has no intention of putting his feet up. He still wants to underline his status as one of the world's best kite surfers, but also in the future, try to kite surf down the River Neva, in his native St. Petersburg.